Cheri was born in Tallahassee, Florida and attended Catholic school there. After graduating high school, she worked as a secretary with the Florida Department of Environment Regulation, an environmental lobbying firm, and then as a legal secretary. She married her husband Chris in 1992 and they have two sons, Danny and Matthew. She and her family moved to Morehead City in 1998 after Chris accepted a job with the National Weather Service office in Newport. She became a stay at home mom for several years while raising her children and volunteered with the schools as PTO President, PTO Treasurer, Class Mom, Advisory Council, and Band Treasurer. She served as a Den Leader and Treasurer while her sons were Cub and Boy Scouts. She also served as Treasurer of her church, taught Sunday School and worked with the Middle and High School Youth Groups. After returning to work, Cheri was the Office Administrator at Shepherd of the Sea Lutheran Church for several years. 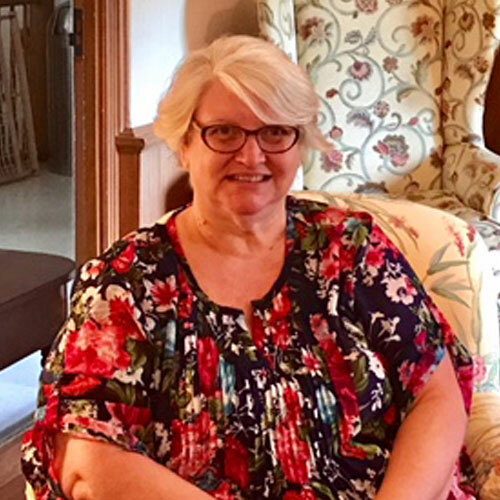 Cheri enjoys volunteering with children and is known as “Mama Bear” to the many children and young adults she has “adopted” as her extended family. She likes to read, enjoys crafting, sewing, crocheting, and traveling. She is also “mom” to two dogs and three cats, most of whom are rescues.